American Airlines, according to Bloomberg, is planning to phase out and retire 45 of its older Boeing 737-800s by 2020. The company, which recently took delivery of its last Boeing 737-800, currently has 304 737-800s in service. This will be the peak number for the fleet as the airline continues to take delivery of newer MAX 8s. AA plans to have 100 MAX 8s in service by 2021. American took delivery of its first 737-823 (N901AN, above) on February 7, 1999. 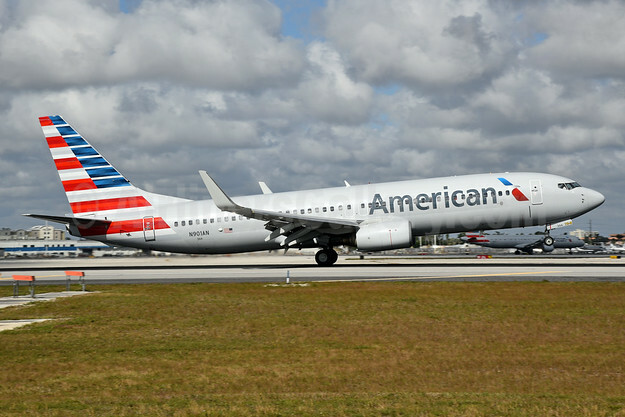 Copyright Photo: The original AA Boeing 737-800: American Airlines Boeing 737-823 WL N901AN (msn 29503) MIA (Bruce Drum). Image: 104635. This entry was posted in American Airlines and tagged American Airlines, Boeing 737-823 WL, msn 29503, N901AN on March 13, 2018 by Bruce Drum.